Curse you Kellogg's! When I saw the box for this new cereal, I got very hungry. Chocolate and vanilla were intermingling - flowing smoothly in a creamy dance. Even the characters Snap, Crackle and Pop seemed happier than usual. They looked very proud holding out pieces of the "Chocolatey & Vanilla Sweetened Rice Cereal". Yes, this was a box filled with promise. "Eh" is the sound I make when I'm not too interested in something. Unconsciously, I usually accompany the sound with sort of whaddya-talkin'-about open-arm palms-up hands gesture. "Wanna play Scrabble?" Eh... what else you got? Unfortunately, this cereal is nothing to get excited about. The "Chocolatey" pieces don't taste particularly like chocolate and the vanilla pieces don't scream vanilla. The two near-flavors combine to create a generic sweetness. It's sort of like when you're at your grandma's and she gives you a piece of hard candy. You know it's supposed to be some kind of fruit flavor, but you can't narrow down which fruit it is, and you're not interested enough to ask. In that respect, this cereal will please some people. If you're after a sweet cereal for a non-Mr-Breakfast-recommended sugar fix, go ahead and see what you think. If you love chocolate and/or vanilla, look somewhere else for satisfaction. Original Cocoa Krispies is one option I'd recommend. Not all the news here is bad. Our pals at the Rice Krispies divisions of Kellogg's deserve some kudos for trying. Recently, they've also given us Organic Rice Krispies, Berry Krispies, and Rice Krispies With Real Strawberries. New cereals are fun even if they're not all great. It's a kick to walk down your cereal isle and see new options. They have a winner in Rice Krispies With Real Strawberries. I like to imagine in some cartoon kitchen, Snap Crackle and Pop are hard at work on other flavors. What will they come up with next? I'm anxious to know. But, do I want another bowl of Choconilla? Eh... what else you got? 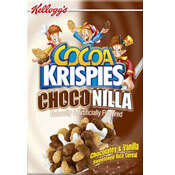 What do you think of Cocoa Krispies Choconilla? I'm trying to find were I can get some. They don't sell them in the Washington store at least all the stores I've been in. Bring this cerial back pleaseee!!! :( I love it!! This was such a great cereal - PLEASE bring it back! Hello I'm not a big cereal person , but when I saw this cereal brand, I wanted to try it. I did and never have I ate anything so amazingly tasteful. But sadly I can't find it now. PLEASE BRING IT BACK. I loved this cereal PLEASE bring it back!! I wish this product had not been discontinued. This cereal was amazing regardless of whatever anyone has to say! These make dang good rice krispy treats. It's been discontinued and I am highly bummed. This was by far my favorite cereal ever. 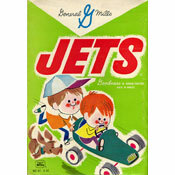 It was also a great stoner cereal if you decide to partake in that on occasion. Best cereal ever right here!!! Not so much chocolate and not so much vanilla, but I'm hooked on it!!! I love this cereal, the taste is great. Only complaint is i cant stop buying it twice a month. Thanks! I fixed that up. I always appreciate when you breakfast lovers find anything that makes the site better. "You know it's supposed to be some kind of fruit flavor, but you can't narrow down which fruit it is, and your not interested enough to ask." You used the improper form of your. It's You're, not your. Ah! Sorry, it's a pet peeve of mine.